When you stay at La Quinta Inn & Suites Myrtle Beach - N. Kings Hwy in Myrtle Beach, you'll be by the ocean, within a 10-minute drive of Ripley's Aquarium and Broadway at the Beach. 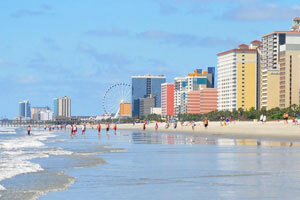 This hotel is 2.9 mi (4.6 km) from SkyWheel Myrtle Beach and 3.9 mi (6.2 km) from Family Kingdom Amusement Park. Make yourself at home in one of the 148 air-conditioned rooms featuring refrigerators and microwaves. Flat-screen televisions with cable programming provide entertainment, while complimentary wireless Internet access keeps you connected. Private bathrooms with shower/tub combinations feature complimentary toiletries and hair dryers. Conveniences include desks and coffee/tea makers, and housekeeping is provided daily. Be sure to enjoy recreational amenities including an outdoor pool and a fitness center. This hotel also features complimentary wireless Internet access, concierge services, and a television in a common area. Grab a bite from the grocery/convenience store serving guests of La Quinta Inn & Suites Myrtle Beach - N. Kings Hwy. A complimentary hot/cold buffet breakfast is included. The preferred airport for La Quinta Inn & Suites Myrtle Beach - N. Kings Hwy is Myrtle Beach, SC (MYR).